Assessment & evaluation in AAC does not end once an individual possesses a communication device. Ongoing collection of information about linguistic, operational, social and strategic competence must occur long-term to inform intervention goals, monitor communication development & determine if the individual is achieving maximum benefit from their device. This involves the collection of communication data to measure change. Cross & Segalman (2016) state that “To make a statement about change in the absence of some kind of metric is speculation and not evidence, and it is important that evidence drive educational and clinical practice.” So, what methods can we use to obtain such evidence? Low-tech data collection tools are very important. They can be highly qualitative & are easy to use & adjust for different contexts. You can find useful tools for collecting observation data in the Resources section of our website. However, the process of collecting written information may interfere with the interaction itself, & information may be missed. It may also be a challenge to record enough video or audio during therapy sessions to provide adequate data, as the language samples collected may not be large enough to provide a representative sample of an individual's communication. It is important to supplement this with high-tech data collection. Some speech-generating devices use automated data logging (ADL) to continuously collect information about how the device is used. 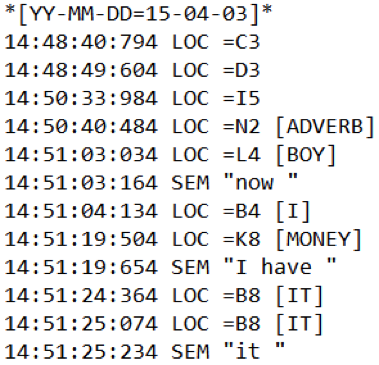 In Liberator's devices, data logs are stored as 'Language Activity Monitor' (LAM) files. This setting is off by default and must be turned on in the settings. LAM files are text files that can be analysed to gain information such as to when different parts of speech are employed & lexical diversity, as well as how & when the device is used. Such information can be incorporated for trial & initial assessment purposes, as well as for ongoing evaluation. In addition to a timestamp, each line will contain a marker that tells us more about the key activation, e.g. 'LOC' = the location on the grid of the key selected, 'SEM' = a word produced using Semantic Compaction, 'SPE' = a letter selected from the device keyboard. This information is detailed & valuable; however, it can be difficult and time-consuming to interpret. Several manual and semi-automated systems have been developed to assist in this process, such as QUAD - Quick AAC Development Profile (Cross, 2010) or SALT - The Systematic Analysis of Language Transcripts (Miller and Chapman, 1983). You can find out more about using the Realize Language tool, by visiting the Resources section of our website. Lesher et al 2000. A universal logging for augmentative communication. Paper presented at the 2000 CSUN Conference, Los Angeles. Davidson, K., & Hettenhausen, A. (2016). 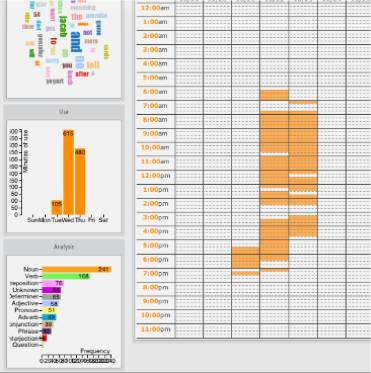 Using Automated Data Logging to Track Progress & Plan Intervention: A Case Study. Paper presented at the 2016 ISAAC Conference, Toronto, Canada.